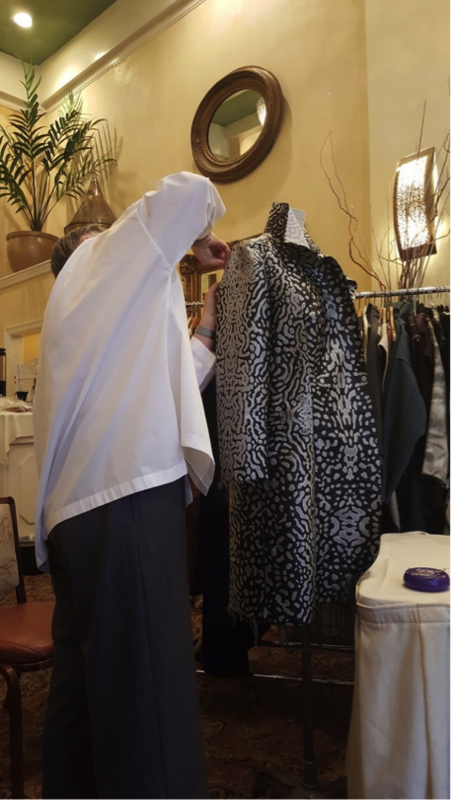 This day began with Kathryn leading us through her couture method for setting a sleeve into a jacket or coat. Did you know tailored sleeves are sewn in by hand with a backstitch? There is always more to learn when it comes to sewing and that is one of the big reasons I sew. Kathryn’s sleeve tutorial for Emma One Sock can be found here. Kathryn sets the sleeve into Shams’ coat. 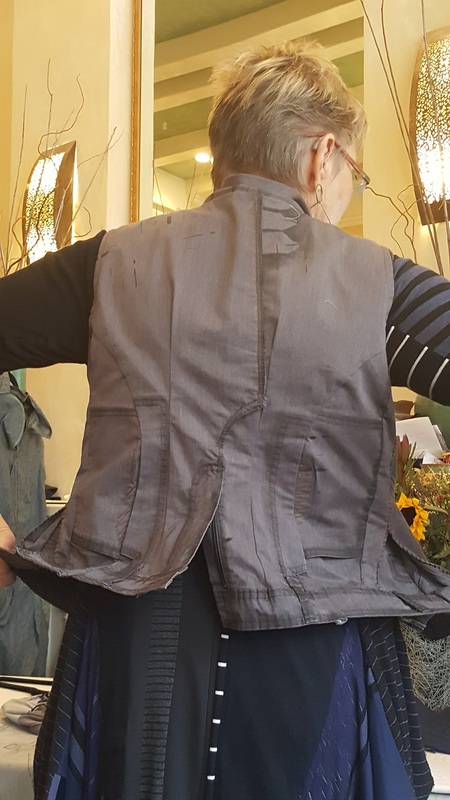 Later in the day, Diane shared her tips for refashioning garments, encouraging us to ask questions as we work that don’t have “yes” or “no” answers. When removing a sleeve from a garment, be sure to mark the sleeve front and back; leave seam allowances attached to the bodice. When designing a garment, she encouraged us to focus design interest on areas of our body we want others to see rather than covering up areas we would rather hide. This last day was one of packing up and coming together to share what we had gained from our week long time together. None of us wanted the retreat to end and the farewells were reluctant ones. This experience far exceeded my expectations. I learned so much from both Diane and Kathryn. I also learned more about myself, my abilities and the direction I want to take my future sewing. Perhaps, best of all, was meeting some of the sewing bloggers I’ve followed for years and making new sewing friends from across the US and one in Vancouver, BC. I hope to cross paths with many of them again. I highly recommend trying a sewing retreat or joining our local chapter of the American Sewing Guild, Columbia River Sewing, to experience the camaraderie of sewing with and learning from others. A variety of clothing and shoe stores along Main St.
Hopefully I haven’t left anyone off this list! Farewell Ashland – I’ll be back!